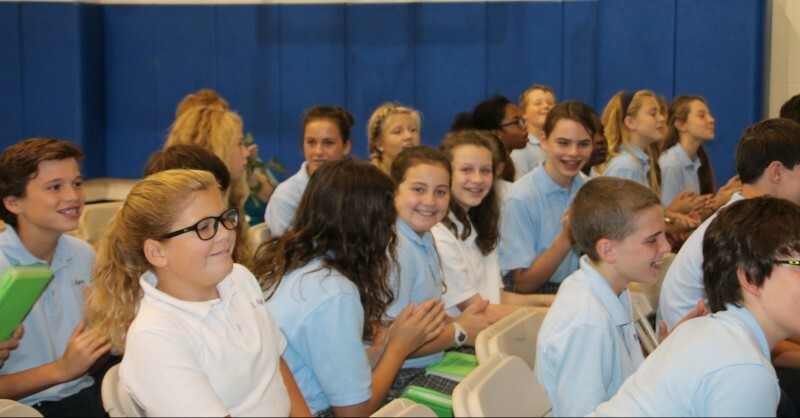 Students of St. Agnes School in West Chester learn at an assembly that their school has been chosen for a National Blue Ribbon for excellence by the U.S. Department of Education. The faculty and staff of St. Agnes celebrate the good news of their designation as a Blue Ribbon school. Three parish elementary schools in the Archdiocese of Philadelphia received the prestigious 2015 National Blue Ribbon School designation from the U.S. Department of Education, it was announced on Sept. 29. Of the more than 4,000 public, parochial, private and charter elementary schools throughout Pennsylvania only 17 received the designation this year. Recognized within the archdiocese are Our Mother of Consolation School in the Chestnut Hill section of Philadelphia (it was the only city school on the list), St. Agnes School in West Chester and St. Norbert School in Paoli. The only other area schools recognized were Holicong Middle School in Doylestown and Radnor Middle School in Wayne. Nationally the award for elementary schools was given to 335 public schools and 50 non-public schools. All the selected schools will be honored at a ceremony in Washington, D.C., Nov. 9 and 10. The Blue Ribbon School designation was established in 1982 when William Bennett was secretary of education. Its goal was to promote high quality standards in education by recognizing elementary and secondary schools as models. At St. Norbert School, which has 213 students, Principal Mary Kay Hennessy explained you have to be a high-performing school to receive the award. If St. Norbert was not a really good school it could never survive because it happens to be in one of the top public school districts in the country. “You have to stay strong to survive,” Hennessy said. In addition to high Terranova standardized test scores, St. Norbert’s teaches Spanish in the upper grades and has just added Latin, which is taught one day weekly by Norbertine Father Theodore Antry. Also, all the students have iPads; kids in grades five to eight may take the computers home after school, and there is a state-of-the-art science lab. At St. Norbert the tuition for one child is $3,800 but the actual cost is $5,300, with the balance made up by subsidies and grants. By contrast, per pupil expense in Pennsylvania public schools is well over $13,000, according to published statistics. That means St. Norbert’s and other parish schools are providing a very good bang for the buck. St. Agnes School has been a West Chester fixture since 1873 and under the guidance of the Sisters, Servants of the Immaculate Heart of Mary all that time, according to Sister Joan Felicia, the principal. The school has a strong faculty with half of the teachers holding master’s degrees in education, and great support from the parents. 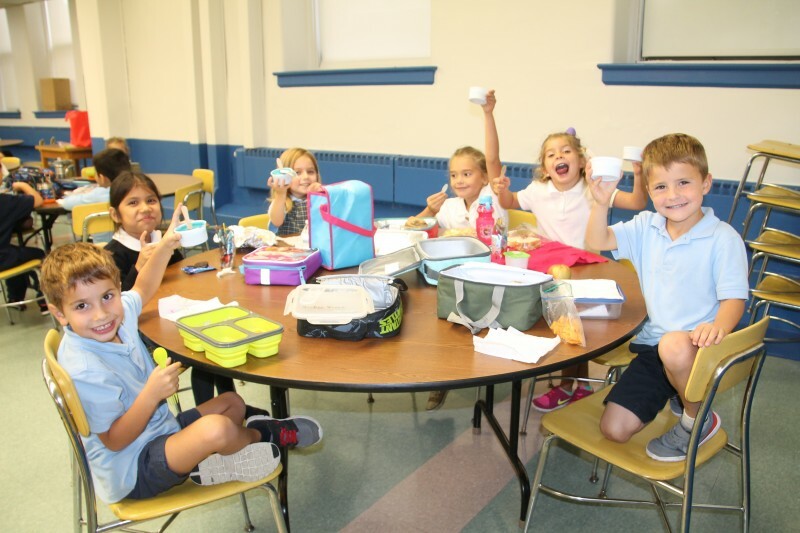 The young students of St. Agnes enjoy blue water ice to celebrate their school’s 2015 Blue Ribbon award. “We try to be on the cutting edge of education by implementing new things as they came along,” Sister Joan Felicia said. For example, in cooperation with nearby West Chester University there is a peer-to-peer project that couples eighth graders with WCU students for writing skills. There is also an after-school program in the computer room where faculty can hone technology skills to apply to their teaching. There are any number of community outreach programs, including “Locks of Love,” through which girls in the school can have their long hair cut to donate for wigs for children with cancer. It didn’t count toward their award, but this year the students raised $2,000 to send to IHM-run schools in Peru. While over the years a number of Catholic elementary schools in the archdiocese have received the Blue Ribbon recognition, Our Mother of Consolation, with 223 students, is the first city parish elementary school to achieve this, although Catholic academies have been past awardees. Because OMC is located in Chestnut Hill, the wealthiest area in the city, one might expect it would naturally be a high-achieving school. The fact is, in addition to having some children from families that could well afford private academies, it also draws many of its students from nearby Philadelphia neighborhoods that are far from wealthy, and it is getting by in a 150-year-old building. Earning an award is nice but the school doesn’t intend to rest on its laurels. Hagy, a gardener in his spare time, sees the school as a garden and a work in progress. “You have to constantly nourish it so it flourishes,” he said. It takes a strong faculty, parents who are interested, an active school board and school advisory board. “When everybody works together things happen,” Hagy said. Saint Agnes School in West Chester is undoubtedly a model of Catholic Education in Philadelphia. Because the school mixes love with a pursuit for excellence in all things, I find it unsurprising that Saint Agnes would be featured as a model at the national level. Congratulations to all who keep Saint Agnes a vibrant place where children grow in faith and knowledge of each other and the Lord.